The United States is in the midst of a deepening opioid crisis. IPRC researchers engage with state and community partners to develop solutions to mitigate and prevent long-term opioid use and overdose. Many states, including North Carolina, have developed opioid action plans. Our research is responsive to the research needs articulated in these plans. Building on earlier outreach efforts in 2016 and 2017 to identify research priorities to respond to the opioid crisis, in May 2018, the IPRC and key partners, including the NC DHHS, the NC Translational and Clinical Sciences (NC TraCS) Institute, the Duke-Margolis Center for Health Policy, and the UNC Gillings School of Global Public Health, convened more than 70 experts from state agencies, academic centers, and area businesses to operationalize a key step outlined in NC’s Opioid Action Plan: “..establishment of an opioid research consortium and a research agenda among state agencies and state institutions to inform future work and evaluate existing work.” The outputs from this event are being compiled into a report that will be shared with the Governor’s office. 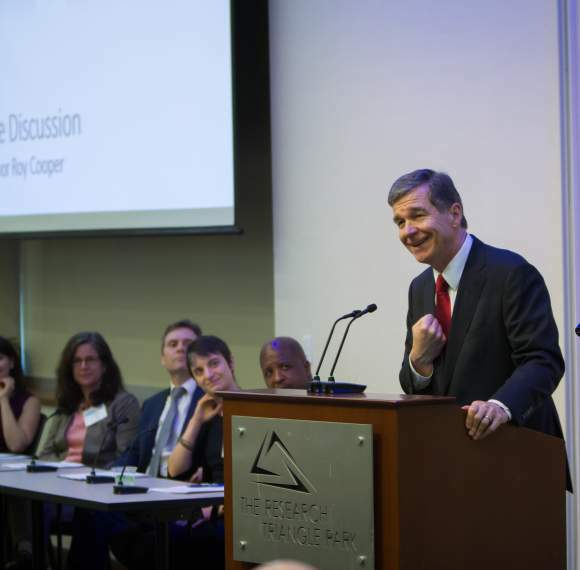 Keynote speakers: Governor Roy Cooper; Secretary of Health of NC, Dr. Mandy Cohen. IPRC is proud to support UNC students in conducting cutting-edge injury and violence prevention research, including the Opioid Student Research Group. This group aims to add to the knowledge base of opioid overdose prevention research and engage students, faculty, and staff in collaborative research or practice work related to opioid overdose prevention. Kristin Y. Shiue is a doctoral student in the Department of Epidemiology. Before coming to UNC, she received an MPH in Epidemiology from the East Carolina University Brody School of Medicine and worked at IQVIA as a member of the Injury Surveillance and Analytics team, collaborating on research efforts to examine injury and player health in professional sports leagues such as the NFL and NBA. Beyond sport-related injury, Ms. Shiue’s research interests focus on opioid use disorder and overdose prevention, particularly the leveraging of large healthcare databases and integrated data systems to develop effective strategies for mitigating the ongoing opioid crisis. Anna E. Austin, IPRC doctoral student and research assistant, is a member of the Attorney General’s Collegiate Council on Opioid Misuse which is comprised of undergraduate and graduate students from colleges and universities across North Carolina. Using input from key stakeholders and subject matter experts, council members developed a toolkit of resources and strategies for students to use to address opioid misuse on their campuses, as well as in communities across North Carolina. Council members are conducting outreach activities to campuses across NC, including discussion panels about the NC Good Samaritan Law. The purpose of these panels is to bring together experts from diverse disciplines to engage in discussions with students regarding substance misuse broadly and opioid misuse more specifically. Discussions focus on the use of combined prevention, treatment, and enforcement strategies to address substance misuse.